Using and designing your brand new blog! These five steps are all you need to start a blog. If you want to blog with the intention of making money all while living an amazing fulfilling life, just follow the steps below. Before that, I will share a short intro of my personal experience and what I recommend for all of you reading this! Skip the intro and jump to the Steps! I created my first WordPress.com blog in November 2017 with the intention of blogging for income. I ended up buying Siteground hosting in March 2018 and transferred my WordPress.com site(soyvirgoblog.wordpress.com) to WordPress.org (soyvirgo.com) once I saved up enough money. The reason for migrating my blog was to make money and do more for myself. I decided to blog for income because, to be honest, I don’t like dealing with people. My blog will help me reach my goals, which I explain later in this post. I’m pretty good with researching, so I just googled my way into being a website owner. If you’re not super tech savvy, don’t be discouraged. This post should help you start a blog with no hassle. WordPress.com limited a lot of things for me, like theme editing, monetization (making money), customization, site ownership and more. I wanted to make money with my blog, and having a free blogging site was hindering my chances at making any, fast! Free things usually mean you get no-service at all. Having the free wordpress blog was great and all, but I felt stuck. It’s hard to get noticed as a blogger when you’re on a free host like wordpress.com. Switching from free to self-hosted can take some time and if you don’t have help, it can be a huge hassle and can be costly. When I switched from my wordpress.com site to wordpress.org / self-hosted, not everything transferred like some images in my media library, comments and likes. So, it’s best to start as a self-hosted site sooner than later. Having a free blog means many cool features are limited. You can’t add code into your blog, no ads (for making money) no access to free tools to get your site noticed and much more. You can’t have a cute website url. I don’t know about you but I hated linking people to “soyvirgoblog.wordpress.com”. It’s long and annoying, and since I was trying to make money with my blog, it was hard to get taken seriously. If you’re not convinced in owning your own blog and you would rather start a free blog, I suggest WordPress.com! Start with wordpress.com if you think you might transfer to a self-hosted site later, like I did. It was incredibly easy to migrate my free site to what is now SOYVIRGO.COM. I did it all by myself and Siteground (my hosting service had really easy migrating tools and so does Bluehost hosting.) I believe anyone can do it themselves using this guide. If you’re still interested in making an amazing self-hosted blog, keep reading! Write down a list of reasons why you want your own website. Ask yourself what you want to share and what your blog goals are. Identify who you want your target audience to be and who you want to attract. This is a good time for you to choose a niche. A “niche” or topic is not always necessary, but it can be helpful in deciding your site goals. Beauty bloggers are in the beauty + makeup niche. Travel bloggers are in the travel niche; you get the idea. I’ve read posts saying you need one niche, but I don’t believe that to be true for everyone. There are many bloggers who are in many niches, so just find what you have knowledge about and write about it. The point is to solve your readers problem, and give your own experiences so readers can connect with you more. Be relatable! The goal for any money-making blog is to become the top resource for a certain niche. So be sure you are passionate in the topic/niche you choose. My goals are to bring like minded people to me, including cat lovers + bloggers, so that we can make one big happy community. Read more about my blog goals here. Your readers will be attracted to whatever topics you write about when they see your passion flow through your posts! The problem is you have to find a passion that will also bring you money! Try choosing a name you will not get annoyed by. What’s important is choosing a name that may attract your target audience. Mine is soyvirgo.com. If you choose a more specific niche like traveling, choose a name that has words like: travel, wander, adventure, etc. Don’t take too much time on this step because it usually doesn’t matter. What matters is how well you promote your blog posts and bring viewers to your blog. If you don’t have ideas, use your name, or think of something short, catchy and easily memorable. Continue reading to learn how to get a FREE site name through your hosting service. The best blogging platform is WordPress.org. All platforms have pros and cons, but WordPress is the most popular for bloggers (see why here). When I was blogging on soyvirgoblog.wordpress.com, I felt stuck because I couldn’t do more to my blog other than change the theme using limited themes, and making blog posts. That’s when I decided it was time to go self-hosted. I needed to make money so the only way really was to go self-hosting. Read: How to set up WordPress with Siteground Hosting! This guide will teach you how to start a self-hosted WordPress blog. What host should you use? I recommend a host I have paid for and used for a while now which is Siteground.com. They helped me even when I shut down my own site for a few minutes. I never plan on switching after how fast they helped me get my site back to normal, all for free! If you’re not sure whether to choose Siteground or Bluehost, I recommend reading this post. Click to start with siteground hosting Read: How to set up Siteground hosting. Bluehost is a hosting service suggested by many bloggers and website owners. It has many amazing features and is usually cheaper than Siteground. I only recommend Siteground as I have been using it, so it’s up to you to decide which is best for you! Don’t worry, the cheapest option is fine for starters. If you can afford it and plan on making lotsa money with your blog, a.s.a.p, choose choice plus! If you’re not 100% sure about blogging yet, just choose basic and 12 month plan. Click to get the cheapest price on the basic plan. On the next screen, you’ll enter your blog name. Don’t have one yet? You can easily move on and choose one later. Use the widget above to see if your desired domain is available. If you have previously registered a domain and want to use it for this new site, enter it on the right. Don’t have one? No worries, just enter your desired domain on the left. If you’re not ready, wait a bit and a popup should appear. Click on “Choose Domain later”, and continue with the following steps! Choose an account plan based on how far in advance you want to pay. 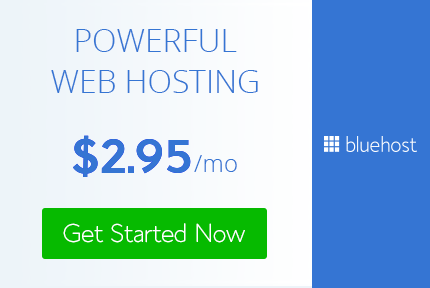 Bluehost does not offer a monthly payment option, only yearly. Remember: Basic is all you need if you’re a beginner. The total is what you’ll pay today. You won’t have to pay again for 12, 24, 36 or 60 months, depending on the account plan you chose. Next, fill in your billing information, confirm that you’ve read the fine print and click Submit. After your purchase is complete, you’ll be asked to choose a password. Just click the “Create your password” button to choose a secure password. Remember to write all this information down somewhere safe, or make sure to know what email all this information of yours is being sent to! This password will allow you to login and get started. Need more help with setting up bluehost? I recommend this post by pickledplum.com. You can start working on your WordPress site right away. Click the blue login button in the “Congratulations!” window to get started with WordPress. Click the “Start Building” button which will take you to your new WordPress dashboard. The black column on the left indicates your WordPress dashboard. This is where you will be making all your posts, customizing your blog and all that jazz. Step #5: Using your New Blog! Time to jump around and celebrate because you’re the proud owner of a self-hosted WordPress site! Take a break and focus on your next goals! Once you have taken a nap or went out for a tasty drink, check out the next steps to starting a successful blog. Learn more about blogging by visiting my Blogging category for a list of tips, tools & tutorials. Write an About page, Policy Page, Work With Me page, and other important pages on your blog. Apply for Affiliates, Sponsors, Guest Posting and Google Ads! How do I log into WordPress once I log out? You can always log into WordPress by going to yourdomain.com/wp-admin. Substitute “yourdomain.com” for your actual domain name. Ex. mine is soyvirgo.com/wp-admin. Just sign in with your credentials. If you don’t remember your login info, find the welcome emails sent to you when you set up your site. Want to change your theme? Find cute cheap WordPress themes for under $10. My current theme cost me $2. See more amazing blogging resources here. Want to brand your blog the right way? How do I get people to visit my blog? Add the Yoast SEO plugin to be on your way to google’s first page! Read this post for some help on getting visitors to your blog. Did this post help you? Do me a kind favor and share it with your friends! NOTE: This post contains affiliate links. Please read my disclosure for more info. This comes at no cost to you. The links help me in bringing the best products and valuable knowledge my readers.